"A Revolutionary New Technology!" certainly makes for a more captivating headline than "We Continue to Evolve Our Decade Old Classic", but the latter generally yields as good or better sounding headphones than the former, in my experience. And so it is with the venerable Audio Technical ATH-M50 as it has evolved into the M50x. Unsubstantiated rumors have circulated about changes in the "white box" version of this headphone a couple of years agoof this I have no knowledge, but I can tell you that the current M50x headphone is different sounding than the previous M50s I've heard...and it's quite a bit better to my ears! The Audio Technica ATH-M50x is a full-size, circumarual (around the ear), sealed headphone constructed largely of rather pedestrian looking black plastic parts. Some metal parts are used in the headband construction. My previous experience with these cans is that they're about as durable as a bench vice...and about as stylish. In an effort to spark up the looks a bit, Audio Technica now offers this model in both blue and white versions in additional to traditional black. The headband padding seems just slightly more plush on the new model, and ear pad covering pleather and foam pad both seem significantly softerthough the foam does not appear to be memory foam. Rather than being hard-wired, the M50x now has connector on the left ear capsule and comes with three cables: a 3.0 m coiled cable, a 3.0 m straight cable, and a thin 1.2 m straight cable (no remote or mic) for portable use. The short cable is terminated in a slim-ish 3.5mm stereo plug, the two long cables are terminated with 3.5mm plugs with mating threads for the included 3.5mm to 1/4" headphone plug adapter. The earpiece connector is a proprietary 2.5mm stereo jack with integrated locking mechanism. The locking mechanism works well and is desirable with relatively fragile 2.5mm stereo jacks, but in this particular case will make after-market cabling options difficult. The Audio Technica ATH-M50x is available in three colors: black, white, and blue/tan. The ATH-M50 is not a headphone you buy for its stylingunless you're into "utilitarian" as a fashion statement. The M50x is available in two colors other than black though: white, and blue/tan. Franky, I'm fine with utilitarian blackits not the way they look on my head that makes me smile. It seems to me quite a few of the recent headphones with a focus on style have had problems in the comfort department. Not so the M50, while the design may look a bit clunky, its quite comfortable and ergonomically functional. The inexpensive materias of the ear pad and headband may cause these headphones to get a bit warmer and stickier than the nicer materials of more expensive headphones, but in this price range I find the generous proportions and good fit of the M50x a pretty good value. Headband adjustments are easy and secure; fit on the head is somewhat close and enveloping. This is one of those "hugs your head" headphones, in a good way. The earpads fold up and inward to reduce in size for transport and storage, but they also swivel 180 degrees so the earpads lay flat on the table when you take them off, and flat on your chest when you wear them around your neck. DJs will be glad to know you can flip one earpiece up with the pad against your skull above you ear for single-ear listening. In other words, the Audio Technica ATH-M50x is a headphone that adjusts folds and swivels in all the ways you'd want a headphone to. Usually I'm unable to comment on product reliability as most headphones reviewed are too new for any info, and/or I only have one product sample to look at. Since the M50x is is relatively unchanged from the previous model, I thought I'd have a peak at the reliability of the older ATH-M50. I gave Mike Olsen over at HeadRoom a callhe's the returns and repairs manager there and sees pretty much every failed product returnhis comment was that he doesn't ever remember seeing an ATH-M50 returned. I'm sure HeadRoom has sold hundreds of M50 headphones. My guess, which includes a decade of personal experience with the M50, is that the M50x is a pretty reliable headphone. The new M50x sounds substantially better than the M50 of old, flip the page and we'll have a listen. I wonder how the M50x compares to the MDR1R. The streetprices are pretty similar ($170 and $190, respectivley) and they seem to both serve similar purposes, though it sounds like the MDR1R may be more confortable. ...like pretty straight forward competitors now at this point. Agreed. The MDR-1R is a mid-centric phone and is certainly a bit more fashionable. But you pretty well have to Dynamat mod it to get its bass under control. A little bit of mass loading goes a long way with the 1R's. Crazy comfortable though. Should be "SRH840" instead of "880". Why rule out sample variation? Diaphragm break-up is one of the most commonly observed sampling variations. Is there any reason that this is ruled out in explaining the difference bewteen M50 and M50X? This might only be ruled out if at least several samples from different production batches were measured and compared between the two models. I own the M50 and have heard multiple others, in the shops, and a few of my friends have it. I've also heard multiple M50x at different shops, and different samples. I gotta say, this isn't sample variation. The M50x belong to a group, and the M50 belong to a seperate group when it comes to their differences in sound. Both are extremely similar, but you can differentiate between the two groups. Also, sample variation within the M50x group (meaning different samples of M50x) seems to be bigger than the variation within the M50 group. Where's the evidence the mean of the M50x is substantially different from the M50 group, or that the M50x sample set has a larger standard deviation? None of that is good, by the way, except for maybe a different mean if it is intentionally and controllable. in today's world would jump at every opportunity to 'innovate', alter, or voodoo up some press release that distinguishes the 'old' m50 from the new and improved one and yet, here we have confimation from the horses mouth at AT that there is no such thing going on and the only difference is the cable being detachable. I'd like to echo Jay's insight and suggest some of my own empirical research to back it up. I stumbled on this inescapable variation fact Jay introduced, on 3 separate headphones that would more reasonably explain the difference you hear while still leaving the possibility that there is in fact a manufactured change. That being process variation or simple unavoidable variation within the line's production. I've bought 6 sets of soundmagic e30's, a dozen magnum driver sets and 3 sets of grado HF2's, and found in each there is difference within a line. No doubt about it. In the case of the HF2's there was the use variable but the other were all brand new and in the same virgin state. You may have to listen to 4-6 sets of m50x's to verify if indeed there is sustained difference from the m50. This difference may be unknown to even the maker of the AT50. That being some difference in material in one or more of the pieces that makes up the driver or cup even though to the eye it may not seem so. It's even more likely if the parts are outsoruced. I wonder if the driver is made inhouse which at this price point I doubt, so it's safe to assume it's cranked out in china and who knows if the plastic they used for this new run is a bit different and so the diaphram ends up sounding a bit different and no one alerted or even knew to alert the heads at AT. Or the copper for the voice coil was not the same in this batch etc. This in my experience is how life works- Making identical things in any realm, craft, or trade seems to go against some law of nature. And headphones and the ear is so sensitive it picks up the slightest of changes. Heck I'll bet at different humidities the same headphone would sound a bit different. It happens with guitar speakers. I've not verified this but word on the street is no two snoflakes are the same structure. We think we can make identical M50's when the creator of the universe didn't/wouldn't/couldn't do it with anything else. Seems awfully presumptuous of us arrogant and deluded creatures. So this is not a knock against AT's quality control. It's inevitable. Take 6 sets of....insert your favorite high end phone here..... and i'll bet you hear difference. But hardly anyone buys several sets of the same headphone to dis-cover this fact. The only folks who may know about this phenomenon is the head makers or quality control guy at each company, but it may not be noticed at that level of sonic scrutiny since it's not what he is looking to find. In the end this may be one of those messy variables of life that no one likes to admit is real because it creates a stir of unsettlement and feeling of vulnerability that life is ultimately uncontrolled. gather 4-6 sets of ANY headphone model and tell me they all sound the same. I do not think your listening tests are adequate to rebut the idea of sample variation. At the moment, either is a theory. It is entirely possible that a headphone/speaker driver manufactured to the same specifications changes slightly over time when the tooling is copied/moved over a long period. wood (pun intended) a person buying an expen$ive headphone, speaker, automobile, etc feel ripped off if that item did not perform as the reviewer's experience? I have M50Ss bought in 2012 and love them. I have modded them using two lengths of coax cable looped and implanted underneath each cup cushion. More comfort and a less closed-in sound. I tend to listen at low volume where the infamous and reviled "V-shaped" response (see Head-Fi) of these headphones is actually ideal. I use these with CDs just using the cheap DAC in my work laptop, through a Cute Beyond amp, and always feel they're all the closed headphone I need, from both a comfort and sound perspective. There seems to be at least two variants of extra equipment supplied with the headphones (at no additional cost). One gets you an extra pair of earpads and the other a Fiio Headphone amp. I would say that it's difficult to say anything definitively without a larger sample pool. Fortunately, the M50 is one of the most popular models of all time (at least among the headphone savvy), so if somebody wanted to assemble a large pile of old vs new M50 samples, it wouldn't be as difficult as, say, a $$$$ headphone. What I find interesting is how the M50 and M50x look virtually identical, apart from the minor differences in the pads, and how the difference between the two samples carries through even when the pads are swapped. The driver itself might be responsible for the difference. I wonder if AT sources them all from the same place, or if there are multiple locations manufacturing drivers. If it's the latter, then we might have our answer, and this might also account for variations noted even before the new M50x model. Tyll, the mold markings ("1" & "2") are cavity identifiers. It is common in injection molding to build a mold that will produce multiples of the same part in a single injection cycle for increased efficiency. The cavities are identical except for an identifier number which gets embossed onto a hidden surface of the part when it is molded. This makes it easy to track down problems with any particular cavity either during development of the tooling or production...the molds will eventually wear and become damaged after many thousands of cycles—it's handy to know when a specific cavity needs repair. You will see these cavity identifiers on almost every plastic injection molded part. It is also common to see a material code embossed onto the part as well. In the photos from the article, notice the baffle is marked ">ABS<" for Acrylonitrile butadiene styrene. Other plastic codes you might see in headphone parts are PC (polycarbonate), PP (polypropylene), PA66GF30 (nylon 66 with 30% glass filling), etc. In my experience, this looks like typical, acceptable product variation for this pricepoint. Every unit will be tested at the end of the assembly line to ensure measured frequency response stays within an upper and lower limit. The graphs in the article look normal to me. For example, I've marked up in magenta what's typical for quality control min/max testing. 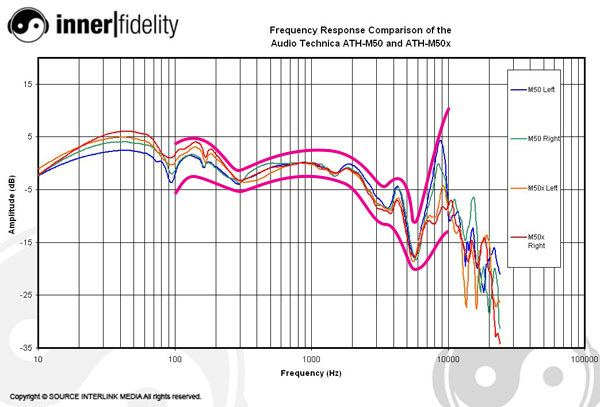 Due to noise and variability of the production environment, data below 100Hz and above 10kHz is usually ignored. This is just an example only; this product may have tighter or looser upper & lower bounds. I figured it had something to do with mold identification. Thanks. I just don't know about the product variation bit. So many paople have commented about hearing things differently with the new cans. Maybe I can get my hands on a few more pair. I'll ask my buddies at HeadRoom to keep an eye out for pairs I can measure. Prolly take a while...we'll see. I was careful to say that the graphs LOOK like typical variation. But we know that measurements can be misleading and are only part of the story. No doubt you are hearing a difference. AT is saying that there shouldn't be an audible difference between the two generations? Reviews are fun, interesting but most importantly - subjective. No quantity of charts and graphs are going to have any meaningful data if the sample is always based on some random, single specimen. A sample of one is barely more meaningful than no sample at all. If you are here for scientific basis than you've come to the wrong place. I wonder if the m50x sounds just like the LE or at least as good. I noticed the LE to be better than my first m50 as well. ATH-M50x LE or Focal Spirit One? I guess these cans have already been bettered. Fron all reports, the Sennheiser HD 380 Pro are better than these ATH M50X. Thanks for an excellent update. I am a student on a fairly small budget looking for a set of headphones mainly for desktop use without an amp and maybe a little bit of traveling, and was pretty interested in the M50x's which are right at the limit for my budget. I've just discovered though that I could get the Philips Fidelio L1's on discount for even a little less than the M50x's. Will the semi-open design make a big improvement in sound quality for mostly acoustic and classical?Are the differences in isolation big enough to not recommend the L1's for travel? I'm very new to the world of headphones, really appreciate the work you've put into this! I cannot comment on these particular headphones, but I have tried two fairly well isolating headphones--Focal Spirit One and KRK Systems KNS6400--as an airline passenger. While they did cut the noise considerably, the aircraft was still too loud to enjoy music. I believe there are non-noise cancelling sealed headphones that isolate well enough for travel on a bus, and possibly a train, but I haven't found any for air travel. The best choices for air travel are in-ear canal earphones or noise cancelling headphones. Tyll's data sheets under Resources can give you an idea of the relative isolation capabilities of various headphones and earphones. There are similar plots available at headphone.com . Of course, if you just need something to pack in your carry-on luggage to listen to later in a hotel, then I guess either headphone you listed would do a fine job. The main problems I find with sealed headphones are (1) they get hot after long listening and (2) they magnify certain noises arising from head motion, the cable, breathing, and even pulse and heartbeat. Again, I haven't owned the M50x, so it may be better than some sealed headphones in this regard. You might have already noticed, but Tyll has also reviewed the L1. Both are of "Wall of Fame" headphones. It was Tyll's review that made me check them out, initially I had discarded them as being out of my price range range at $300, but when I saw then going for about half that I had another look. Tyll's graphs show damping similar to the M50s. I'm an international student, so travel use will be maximum once a year, whereas I'd be listening to the for hours a day at my computer while studying, so was wondering more about the differences in sound signature for acoustic/classical. For lengthy orchestral music (> 45 min) I generally prefer open headphones for reasons of comfort (less heat) and the usually more spread-out soundstage. However, the ATH-M50x looks more neutral at higher frequencies than the L1 according to the frequency response graphs--this might give it a more open sound than the L1. It would be better for someone that has actually listened to ATH-M50x and L1 to chime in on the sound signature. Variance. You'd need to measure a few of them to decide if something's really changed. Recommending them as being improved with just a single example doesn't mean much. The first central theme in quality control is to minimize variation. Even if you have an inferior product, if it is stable in its specs from unit to unit you can still sell it at an honest spec. If AT is experiencing variation in spec in a significant way here, that should be worth mentioning as a bad thing... not as an added benefit. Hi Tyll, you are my favorite reviewer and think you have the best opinions. I've been watching you ever since you started and you are amazing but, to the point when you stated the sounding signature of the ATH M50X's being "uneven", I am dying to know why that is. Is it because of the very little space for the drivers to move and vibrate naturally in their housing? or is it the driver material? I have been searching all over but why is it "uneven" at times. The L1s poop all over the ath-m50xs. A more balanced sound in a nutshell. L1s also isolate almost as good as a closed back, though leak a little more than a closed back too. I would be grabbing a pair before they get sold out (they are discontinued now) and the L2s went for a more V shaped kiddy FR. Thanks Tyll. Just bagged a pair.. I was going for the Nads but these were available on sale in the UK so I thought I'd give them a try after reading the review. I might have to cafe them up a bit though..
Having the M50 and M50X, same source, level matched, there is a marked difference between the two. I suspect driver manufacturing. The M50X is a bit brighter and has slightly different character difference than the M50. I like both, but there is a difference and it's easily noticed. ...and I'm glad I did. I have my 10 year old Sony MDR-V6 that I use for recording field samples with an H4n, and then a variety of headphones, earbuds, and canal-phones from UE, Sony, AKG, and others for working with music in my Ableton Live or MASCHINE on the PC, and more recently on iOS devices. I find them rather pleasant and easier to find bass phasing issues. Kind of like the MDR-V6, but with bass. :-) I wanted the limited edition green ones but wasn't sure I wanted them to begin with. I'll likely get them and make one set for home and one for mobile. I still lean on monitors quite a bit, especially when I realized I had bass swells that were too low for most people to hear (back when I had a 15" sub in the line). So I use a variety of headphones and my cars to get a feel for how new stuff will sound.